The Skype extension allows you to share your favorite pages with your contacts using Share on Skype, and launch Skype for Web with one click, directly from your Chrome and Firefox browsers. How do I get the Skype Extension? Get the Skype extension for Chrome and Firefox. How do I use the Skype extension to share on Skype? 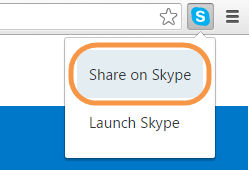 Find a webpage you want to share, then click the Skype extension installed in your browser and select Share on Skype. If you're not already signed in to Skype in your browser, a pop-up or new tab will appear prompting you to sign in. Enter your Skype credentials and click Sign in. The share screen is displayed. Select one or more contacts you would like to share the webpage with, or use the search field to find them if you don’t see them in the list. When you're ready, click the Send button. The webpage is shared with the contacts you selected and the pop-up or tab closes automatically. If you have multiple Skype accounts and would like to share using a different account, click your avatar in the top right on the desktop browser or tap the Signed in as link at the top on the mobile browser. From here you can access My Account, or Sign out (and then sign in with a different account). Click on Launch Skype to access the full Skype functionality offered by the Skype web client. Please note that audio and video calling on the Skype web client is currently not supported on Chrome OS and Linux. How do I use the Skype extension to share Skype video call links? If you have the Chrome extension installed, it'll work out of the box for Outlook.com Mail, Outlook.com Calendar, Google Inbox, Google Gmail, Google Calendar and Twitter. How do I insert a Skype call in an Outlook.com meeting? Just click on the “Add Skype call” button at the top of the page when you create a new meeting! We’ll create a new group and this Skype group’s join link will be added to your meeting’s description. The Skype group’s name will be the name of your meeting. How do I insert a Skype call in an Outlook.com email? Just click on the “Add Skype call” button at the top of the page when you compose a new email! We’ll create a new Skype group and this group’s join link will be added to your email’s body. The Skype group’s name will be the subject of your email. How do I insert a Skype call in a Google Calendar meeting? Just click on the “Add Skype video call” link when you create a new meeting! You can choose to insert a link of a new Skype group or insert a link of an existing group. We will use the name of the meeting as the name of the group. How do I insert a Skype call in a Google Gmail/Inbox email? Just click on the Skype “S” icon when you compose a new email! We’ll create a new Skype group and this group’s join link will be added to your email’s body. The Skype group’s name will be the subject of your email. How do I insert a Skype call in a Twitter tweet? Just click on the Skype “S” icon when you compose a new tweet! We’ll create a new Skype group and this group’s join link will be added to your tweet’s description.